Sleek and stylish, the Northwave Fahrenheit Jersey is designed to provide warmth in autumn and spring. Using a napped 4-way stretch Carvico Colorado® fabric it provides the perfect balance of warmth and breathability for higher tempo cycling. When summer fitness is still lingering into the cooler autumn months or you're adding higher intensity rides into early spring training then you'll enjoy the warmth and breathability of the Fahrenheit Long Sleeve Jersey. The brushed inner of the Carvico Colorado® fabric is wonderfully soft against the skin and traps in body heat. The fabric isn't windproof and this vastly improves breathability and air-exchange leading to excellent temperature regulation particularly when the pace is being pushed. 4-needle flatlock seams are used throughout and this gives the jersey a sleek look and boosts comfort. Across the back of the jersey, the three pockets provide ample space for a tube, multi-tool and nutrition, with a side pocket giving space to safely stow away keys and cash. A fully reflective border area across the pockets gets you noticed on darker training rides and commutes. A. Chest: Wrap a tape measure evenly around the fullest part around the chest under your arms. 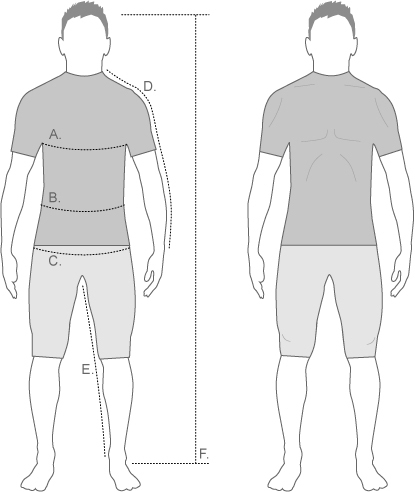 B. Waist: Wrap a measure tape around your natural waistline. C. Hips: Standing with your feet together, measure around the fullest part of your hips. D. Sleeve: Measure from the lowest part of the neck, over the tip of the shoulder and down the outside of the arm, past the elbow and to the wrist. Keep the arm slightly bent. E. Inside Leg: Standing with your feet together, measure down the length of your inside leg to the base of your heel. Northwave Fahrenheit Jersey Long Sleeves is rated 5.0 out of 5 by 1. Rated 5 out of 5 by HarryR from Beautiful Great fabric, great fit, very happy with this top. Used with merino base layer at 4 c and was very comfortable. The ride lasted until it hit 10 C and still very comfortable.